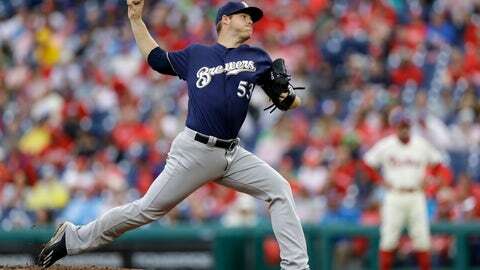 MILWAUKEE (AP) — Young right-hander Brandon Woodruff not only made the Milwaukee Brewers‘ playoff roster, but he’s starting Game 1 of the National League Division Series against the Colorado Rockies. The Brewers’ playoff roster announced before the series opener on Thursday features an 11-man pitching staff that includes rookie right-handers Corbin Burnes and Freddy Peralta. Like Woodruff, they are promising starters who have been pitching out of the bullpen. “He’s just throwing the ball really well, and two, I think he has the potential to do a little more than a reliever, maybe,” Counsell said. One of Woodruff’s four starts came at Colorado, when he allowed seven runs on nine hits in three innings on May 11. The Brewers still won 11-10. Jhoulys Chacin (15-8, 3.50), the Brewers’ best starter this year, is scheduled to take the hill in Game 2 on Friday, when he will be opposed by Colorado’s Tyler Anderson (7-9, 4.55). Left-handers Wade Miley and Gio Gonzalez are the other starters on the Brewers’ roster. Miley (5-2, 2.57) has pitched well in the second half, while Gonzalez is 3-0 with a 2.13 ERA in five starts after being acquired from the Washington Nationals. Right-handed starter Chase Anderson, who gave up an NL-high 30 homers, didn’t make the roster.